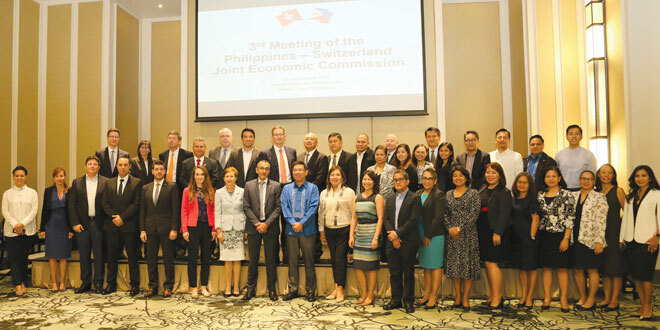 The Philippines and Switzerland convened the 3rdMeeting of the Joint Economic Commission (JEC) in Makati on 20 November 2018 under the joint chairmanship of Undersecretary Ceferino Rodolfo of the Philippine Department of Trade and Industry and Ambassador Erwin Bollinger of the Swiss State Secretariat for Economic Affairs (SECO). “The key outcomes of the meeting include the signing of the Air Services Agreement, the conduct of market studies for three sectors of interest to the Philippines, the technical cooperation through the Global Quality Standard Program (GQSP), and, more importantly, we celebrate the entry into force of the PH-EFTA FTA”, Undersecretary Rodolfo underscored. The new Air Services Agreement expands the flying rights aimed at increasing air traffic for both countries. This includes the fifth freedom traffic rights that may be exercised at points in Europe and Asia. The market studies, on the other hand, are expected to assist government in understanding the specific sectors better thus designing specific interventions that will facilitate the private sector to access these sectors. Switzerland also offered assistance to help Philippine MSMEs on helping meet quality and standards requirements through the Global Quality Standard Program(GQSP). The meeting also discussed the recent entry into force of the Philippines – European Free Trade Association Free Trade Agreement (PH-EFTA FTA) where Switzerland is a FTA member state, together with Norway, Liechtenstein, and Iceland. Bothparties highlighted the salient features of the agreement and committed to promote the utilisation of theFTA. Other issues raised include the enhancement of the Philippine-Switzerland trainee agreement that provides a two-way trainee exchange, a report on the Swiss business mission led by the Swiss-Asian Chamber of Commerce (SACC) in coordination with the Philippine Board of Investments (BOI) and Philippine Trade and Investment Center- Geneva, updates on the Philippines’ accession to the Istanbul Convention (ATA Carnet), and the proposed cooperation in hydropower. The meeting also highlighted the growing role of bilateral and regional agreements and the impact of these agreements on the multilateral tradeagenda. The private sector, represented by Swiss companies located in the Philippines, and the Philippine-Swiss Business Council (PSBC), also had the opportunity to present to Philippine Trade Secretary Ramon M. Lopez their priorities and concerns in relation to the business and regulatory environment, as well as their expectations for the future. The two countries took note of the exchanges and cooperation in various areas and agreed to hold the fourth meeting of the joint economic commission in Switzerland in 2020. The two sides also agreed to meet intersessionally on the new fields of cooperation, and finding resolution on pending issues. The Philippines – Switzerland Joint Economic Commission (JEC) is designed to involve government and business leaders from both countries in projects and initiatives that facilitate strengthening the two countries’ economic partnership.